Inside the depths of the Boston Marriott Copley Place, a landmark thirty-floor hotel in the heart of the scenic Back Bay neighborhood, was abuzz this Thursday evening with the tempered voices of 3,000 college-aged students. Over the preceding three days, these motivated thinkers had streamed in from across the world to attend the Harvard National Model United Nations 2015 Conference, often lauded as the largest and most prestigious conference of its type. Jeffrey Schroeder, the Secretary-General of the Conference and a senior at Harvard College, noted that he was absolutely “thrilled” to “welcome esteemed delegates” from more than 75 countries worldwide, a feat that makes the conference, colloquially referred to as HNMUN, among the most international simulations in North America. HNMUN 2015, Schroeder explained to Agence France-Presse, operates its 30 committees with two major trends in mind: innovation and excellence. A majority of the delegates that we spoke to on the floor of the conference venue echoed these sentiments. In the Special Political and Decolonization Committee (SPECPOL), a large General Assembly (GA) body, delegates explained to our reporters how the introductory session “progressed slowly but surely as delegated debated the question of topic selection.” Particularly notable speeches were made by the France and Germany, who spoke openly to the body on the critical need to halt construction of Israeli-backed settlements in Palestinian territories immediately. Other General Assemblies operated similarly. In the Special Summit on Technology (SST), the delegation representing Colombia remarked that “the committee was debating quite efficiently” and when prompted about the content of debate, that it was “more substantive than expected. Persuasive speeches seemed even more present in the Historical General Assembly, 2000 Committee. The delegations of Greece and Burkina Faso argued back and forth about the relevancy of the Millennium Development Goals in a body where “words frequently trump actions” and rhetoric “rarely leads to success.” Ghana gave an interesting – if not a bit melodramatic – speech on using international funding to ensure adequate access to maternal-child healthcare and primarily education to aid the developing world. Delegates from a number of General Assembly committees unite to share common ideas. 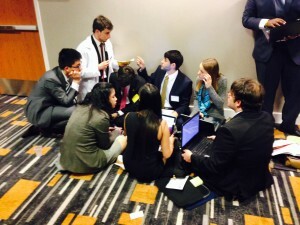 While the delegates at HNMUN 2015 all agreed on how hard they worked, the conference directors also provide many opportunities for stress release and international mingling. On Thursday night, the 3,000 delegates were treated to a “club night” at Guilt, a local nightclub that is popular with university students. Delegates complimented the choice of venue, noting that the interior was “sleek and spacious,” albeit “a bit hot and sweaty” due to the presence of so many delegates. Still, delegates praised the “fully-stocked bars” and “great choice of music” along with the chance to meet, dance with, and form lasting bonds with delegates from around the world. In line with years of tradition, HNMUN 2015 remains committed to community involvement and service. This year, the Conference is expanding its existing partnership with The Resolution Project, an American 501(c)3 non-profit organization that works to cultivate youth leadership and facilitate social entrepreneurship. The specific partnership, referred to as the 2015 Social Venture Challenge, encourages students to “build teams and submit plans for actual social ventures that will make a positive impact” in the long-term. The goals of the organization and the goals of HNMUN – a commitment to social responsibility, a desire to cultivate future trailblazers, and an emphasis on creating tangible change – are surprisingly similar, allowing this partnership to flourish for a second year. Delegations participating in the 2015 Social Venture Challenge will receive a grant of “up to $3,000” to carry out a project in line with the mutual goals of The Resolution Project and HNMUN 2015. Lastly, the HNMUN 2015 has established a partnership with the Schistosomiasis Control Initiative, a nonprofit organization that “treats children and at risk adults for schistosomiasis” and other worm- and parasite-based diseases. The organization hopes to increase voluntary contributions through this partnership to help provide expanded treatment to the estimated 230 million adults who require treatment on the African continent each year. Delegates are able to donate to the Schistosomiasis Control Initiative through enveloped provides in each committee room.